In Tuesday evening’s action from the Daegu Stadium, there was a silver medal for Jessica Ennis (coach: Toni Minichiello) in the heptathlon, whilst Dai Greene (Malcolm Arnold) was a class apart in qualifying for the men’s 400m hurdles final. Ennis, in securing the Aviva Great Britain and Northern Ireland team’s third medal of the championship may not have had an achievable task in the women’s 800m in order to retain her World title, but in throwing down the gauntlet to the rest of the field and running a lifetime best of 2:07.81, she ascertained that she is still one of heptathlon’s top two lap performers and a force to be reckoned with. Ennis, who took to the front from the gun did not have the advantage over Chernova at the end to make headway into the Russian’s points advantage, but will surely take an insight into her 2012 preparations that the heptathlon gold in London is very much for the taking. As it was her run earned her 997 points and was her second PB of day two and her third of the competition, but her overall total of 6751 was 129 points behind Chernova, who set a world leading 6880 to win. “I don’t want to walk away and analyse too much, I don’t think it’s something I’m going to dwell on, it was just one of those days where it didn’t come together, it wasn’t right. “My javelin was so poor and Chernova’s was so good it was enough to take that gold medal. It was a brilliant score by Chernova, but I performed well, I had some PBs so I can take positives away from that and work on the javelin. Looking for a PB points performance, team mate Louise Hazel (Aston Moore) went in the penultimate 800m heat and worked hard to stay in contact with the main group. Powering down the home straight to eek out every last second she could, the 2:15.44 clocking and 887 points meant the Birchfield Harrier finished her World Championships with a points tally of 6149 for 15th position, just shy of her existing 6166 lifetime best. “I really went for it in the 800 as I wanted to secure a personal best, but I was just outside,” she said. 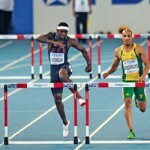 Elsewhere on the track the 400m hurdles had reached the semi final stages and Aviva GB & NI had five athletes competing during the evening, with Dai Greene successful in reaching the final. Greene made short work of his semi final heat in taking an impressive victory in 48.62 ahead of Felix Sanchez of the Dominican Republic. The Swansea man looked superb and even had time to ease off the power in the closing strides in making certain of his qualification. “I ran very slow over the first half of my heat so I wanted to go off tonight a lot more brisk and I thought I did that very well,” he recalled. “When I came off the bend I didn’t see that they were anywhere near me so I took my foot of the gas really. I know in the final I won’t have that luxury so I’m very happy really. In the last semi final heat his teammate Nathan Woodward (Nick Dakin) made a brave attempt at qualifying for the final – doing as he had yesterday promised, and running the race as though it was indeed the final. Going out hard over the first 250-300m, he entered the home straight in the lead only to be overtaken in the closing stages and finish in sixth in 49.57. He said: “I was running right on schedule for the first five hurdles and I’m a bit disappointed, I felt strong and thought I could’ve started coming back from eight, but I got into nine and didn’t feel as strong. “I’m not happy at all. I’m really disappointed as I shouldn’t have been beaten. I really worked on getting in the race, I felt in it and I came strong but for some reason I just wasn’t there,” he said. “It was better than yesterday because I got my strides right. I know what it feels like now to go out there that hard now and hopefully with time I will get stronger. Perri Shakes-Drayton (Chris Zah) ran a solid race and just missed out on progression to the World Championship final by just one hundredth of a second. Shakes-Drayton needed to finish inside 55.06 to reach the final, but her clocking of 55.07 meant she just missed the coveted spot in the final. She said: “I was in the fastest heat I tried my best. I hit a few hurdles that probably cost me the final but I can’t get upset about it, as it wasn’t Perri’s time this time. One athlete however who did not miss out on a slot in her final was Hannah England (Bud Baldaro) who went in the second of the two women’s 1500m semi finals. England ran wide of the pack for much of the race and although she appeared to be off the pace with 200m to go, powered down the final 100m to finish in 4:08.31- taking sixth place but most importantly a qualifying slot for Thursday’s final. “I felt great. I just failed to get in any good positions, I shouldn’t be running like that but at least I didn’t panic but just kept looking for gaps and looking for opportunities,” she said. “It won’t dent my confidence for the final. It was just the way the race went today. I kept thinking I am only 2 or 3 metres off the lead and I am tenth. I tried not to panic and at least no one was running away at the front even if I was not catching. Also in final action tonight was discus thrower Brett Morse, who may not have made the midway cut for his final three throws, but his second round 62.69m effort was a solid outing from the talented thrower who can now build on this championship performance. Morse, who threw a lifetime best of 66.06m at the end of July, may not have achieved that standard in the final but showed the consistency required to make future championship teams it was is fast becoming one of the country’s best quality events. 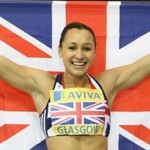 “I’m disappointed but it was good to be in the final having gone through the experience of being in a heat,” she said. World Championship action featuring Aviva GB & NI team members continues on Wednesday morning with Jo Jackson (Andi Drake) in the 20k race walk – there is no evening session on Wednesday at the World Championship.